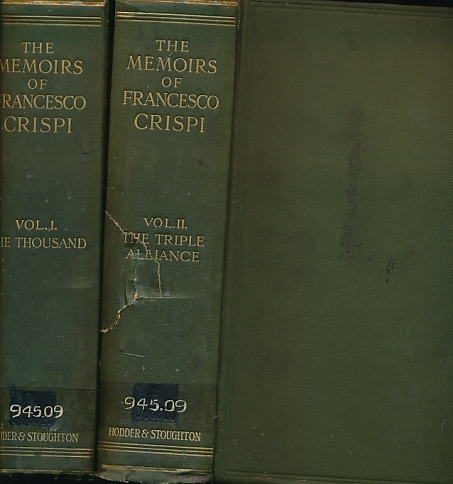 Barter Books : Crispi, Francesco,trans. Mary Prichard-Agnetti : The Memoirs of Francesco Crispi. From the Documents Collected and Edited by Thomas Palamenghi-Crispi, Volume I (The Thousand) and volume II (The Triple Alliance) 2 volumes. 230 x 160 mm (9 x 6 inches) - xiii, 495pp; viii, 484pp + plates. G : in good condition without dust jackets. Ex Newcastle Reference Library. Covers rubbed with split to spine. Italian politician (1819-1901), Crispi was Italian Premier twice (1887-91, 1893-96). A colourful, controversial, and intensely patriotic man, his attacks on Italian liberalism have since led him to be seen by some as a precursor to Mussolini.